Both of the workers have been demoted one rank and had their monthly salaries cut by 5,000 yuan, or about $728, according to an internal memo seen by Reuters. One person, the company's digital marketing director, will have his pay rank frozen for a year. The memo indicated that an outsourced social media firm, Sapient, encountered "VPN problems" with a desktop it was using for publishing, so instead turned to an iPhone with a roaming SIM card to trigger the message at midnight on New Year's. Twitter is normally blocked in China, so a VPN (virtual private network) is a commonplace tool for reaching it. The post — which read "Happy #2019" — was almost immediately deleted, but not before screenshots made their way to social networks like Weibo, where they were roundly mocked. 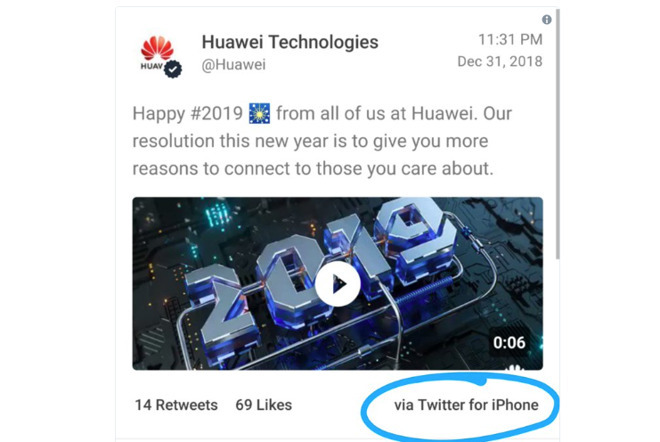 Huawei has had similar embarassments in the past. A notable example was when Israeli actress Gal Gadot, serving as a paid ambassador, promoted the Mate 10 Pro on Twitter but used her iPhone to do it. The illusion of brand unity has become important at smartphone makers around the world, especially given the intense competition between iPhone and Android as platforms. In reality workers will often have devices from rival companies, even at Apple, though corporate leaders sometimes take measures to deter this. Huawei likely has little to worry about in the near future, as Chinese iPhone sales were poor enough in the December quarter to trigger this week's guidance downgrade. That sent Apple shares plummeting, and prompted CEO Tim Cook to promise management would "take action" to put the company on the right course.